Murray Hill Library to celebrate 50 years of community service - The Resident Community News Group, Inc. | The Resident Community News Group, Inc.
Bill Brinton cuts the ribbon for the re-opening of the Murray Hill Library in 2010 after budget cuts forced hours to just 20 per week. The Murray Hill Library, of mid-century modern design, was designed by the same architectural firm which designed the Haydon Burns Library. On the heels of celebrating the 50th anniversary of Jacksonville’s city-county government consolidation Oct. 1, 1968, the Murray Hill Library will celebrate its own 50th anniversary Dec. 15. Nothing more happened for five years until Dec. 17, 1965, when an article appeared that explained that some city councilmen had approached Cecil C. Bailey, then chairman of the Board of Library Trustees, with the idea. Bailey went on to say that they had been making a survey of the area and felt a branch was needed. By February 1966 four sites were being considered by the trustees for the branch, and the selection of an architectural firm was being discussed. The next month a site at Edgewood Avenue and Kerle St. was approved for the proposed branch and the board recommended selection of architectural firm Hardwick and Lee to design the building. A model of the proposed library was unveiled in June 1967, and work began on the branch in November. Mayor Hans Tanzler was present for the groundbreaking. The William E. Cellar Co. was in charge of construction with a cost estimate of $134,510. A Times-Union headline in December 1967 brought the distressing news that “Library’s Branch will be Bookless.” It turns out the $75,000 requested in the 1968 budget for books was eliminated by the City Council. It went on to state the branch would be ready to open sometime in June but would have no books until the new budget could provide them in the fall of 1968.
and his parents, Harry and Jane. The approximate cost of the project was $234,000, excluding books. The book capacity of the library was 22,200 volumes with 15,000 in the adult area and 7,200 in the children’s section. The seating capacity was 116 with the meeting room seating 42 people. First branch librarian was Judy Starling. The new Murray Hill branch soon became the library’s busiest branch with its circulation leading all other branches in 1969. 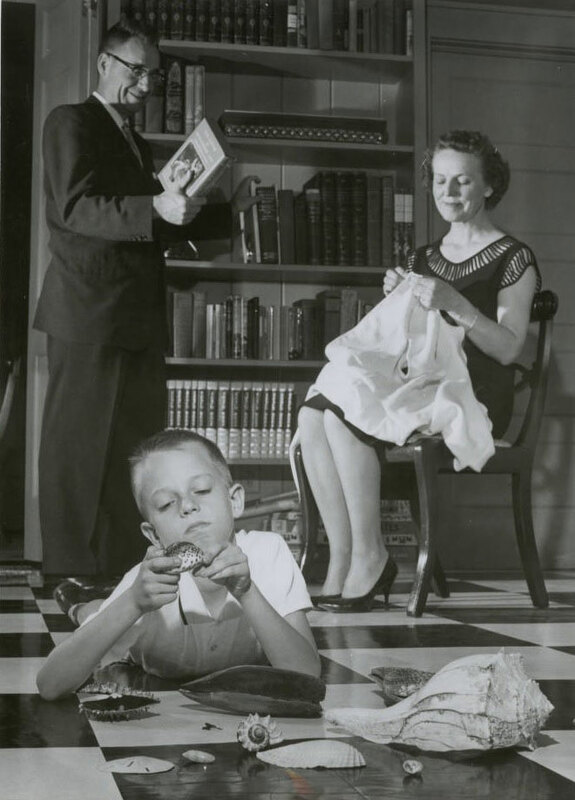 One of those using the new library was a 16-year-old teenager named Bill Brinton, who as a 7-year-old had moved to Jacksonville when his father, Harry Brinton, became Jacksonville’s new library director. He was going to Robert E. Lee High School at the time and went on to earn a law degree at the University of Florida before moving back to Jacksonville to become a lawyer and practice as a litigator and preeminent national expert on sign regulation and the first amendment. Brinton also maintained his strong love of libraries and books that he had as a child. 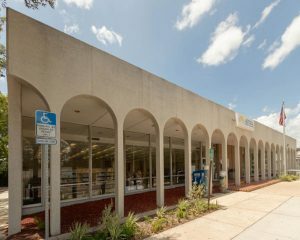 Between 2005 and 2014 the library budget was reduced by 41 percent, resulting in the Murray Hill Library and five other urban core libraries having their hours cut to 20 hours a week in 2010. This was seen as the beginning of the end for these libraries and a group of Murray Hill residents met to mobilize and fight the cut in library hours. Brinton was there to help in the community effort. A new organization, the Friends of the Murray Hill Library, was formed and soon had over 700 unofficial members. The group created a logo and obtained tee shirts, wrote letters to the editor, had television and radio interviews, spoke at the Library Board and City Council meetings, and even held a protest march to the front of the library carrying signs. Thanks to the strong advocacy effort, the hours were restored by the Library Board and the Friends group held a big “Back to 50 Hours” Celebration on Oct. 23, 2010. Brinton, who served on the Friends board from 2010 until his death in 2017, was chosen to cut the ribbon to reopen the library. The Friends of the Murray Hill Library will hold a “Flashback to ‘68” celebration, as well as a tribute to Bill Brinton, Saturday, Dec. 15, 11 a.m. to 3 p.m., 918 Edgewood Avenue S.